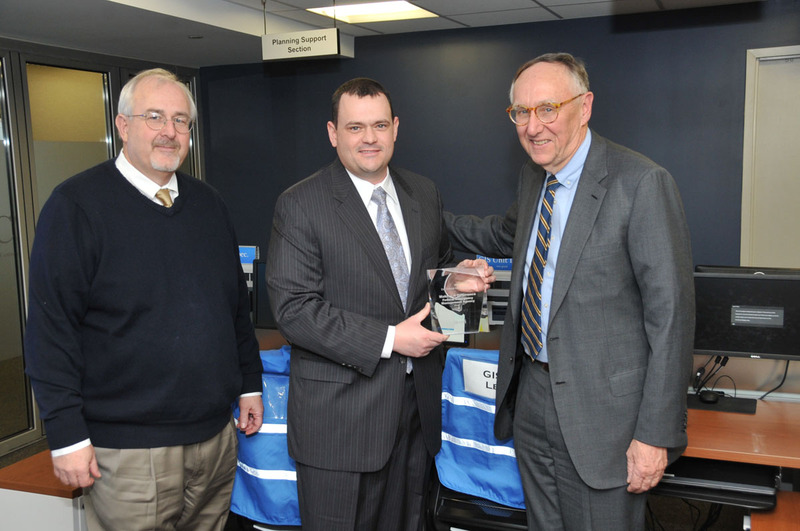 Jack Dangermond, Esri president, presents the 2013 Making a Difference Award to Christopher Vaughan, FEMA geospatial information officer, and FEMA administrator Craig Fugate. The Federal Emergency Management Agency's (FEMA's) efforts to assist after the destruction of Superstorm Sandy—including its first-of-its-kind mapping platform, the GeoPlatform—were recognized by Esri at its annual Federal GIS Conference held in Washington, DC, February 25–27. The company honored FEMA with its prestigious Making a Difference Award, which recognizes organizations doing exemplary work using geospatial technology. The award was presented Wednesday, February 27, at a special ceremony that included FEMA management and Esri president Jack Dangermond. "FEMA supports our nation during crises, and its leadership and staff at all levels work extremely hard to carry out that mission every day," said Dangermond. "We want to recognize their tremendous work during Sandy. The agency supplied intuitive mapping applications that allowed people to understand the emergency as it unfolded and to begin the process of rebuilding." FEMA's GIS efforts immediately provided much-needed information during and after Superstorm Sandy. Taking advantage of Esri's cloud capabilities, FEMA's GeoPlatform supplied the perfect mechanism to build and make available a series of applications that help people impacted by the storm. The GeoPlatform was built using Esri ArcGIS Online. This meant FEMA didn't have to spend time and resources on maintenance and hardware. It could focus on end-user wants and needs in designing applications. FEMA had personnel in different impacted regions publishing map and tabular data using the GeoPlatform. This included aerial imagery, surge models, damage assessments, open and closed gas stations, power outages, and school closures. For immediate response, people could go online and understand what was happening on the ground using dynamically updated information. For long-term recovery, the GeoPlatform helped people and FEMA staff to more quickly process requests for assistance using up-to-date, accessible online information. Check Your Home—People could click on the online map to see how many homes, neighborhoods, and communities were impacted. The application provided easy access to imagery FEMA collected immediately after the storm. Modeling Task Force Map—This map predicted flood areas that would incur damage. Desktop experts ran sophisticated models and published them to the web with updates happening almost daily. Advisory Base Flood Elevation (ABFE)—FEMA issued ABFE maps post-Sandy for the recovery work. As rebuilding efforts take place, the maps and related information help people stay current with new floodplain and insurance guidelines.